Upper Peninsula literature has traditionally been suppressed or minimized in Michigan anthologies and Michigan literature as a whole. Even the Upper Peninsula itself has been omitted from maps, creating a people and a place that have become in many ways “ungeographic.” These people and this place are strongly made up of traditionally marginalized groups such as the working class, the rural poor, and Native Americans, which adds even more insult to the exclusion and forced oppressive silence. And Here: 100 Years of Upper Peninsula Writing, 1917–2017, gives voice to Upper Peninsula writers, ensuring that they are included in Michigan’s rich literary history. The Van Pelt and Opie Library is pleased to bring four of the contributing authors to read from this compelling anthology, followed by a question and answer session and book signing. Come join us on November 2nd from 4:00 pm-6:00 pm in the East Reading Room of the Van Pelt and Opie Library. Light refreshments will be provided. Bryophyte Ecology is the result of more than a decade of research, collaboration and composition by Professor Emerita Janice Glime and many contributors and photographers. The work is unique not only as the most recent comprehensive reference on bryophyte ecology, but because it is “open” to the world. Professor Glime’s goal in creating an open work was “to reach a broad audience in an affordable format with lots of illustrations and a readable style.” Bryophyte Ecology has been used as a textbook, reference source, and field guide. Initially self-published on the web, Bryophyte Ecology is now published on Digital Commons @ Michigan Tech and was the top downloaded faculty publication in Digital Commons @ Michigan Tech for the month of August. The library will host a reception celebrating Professor Glime’s work during Open Access Week. Please join us in the East Reading Room on Thursday, October 26th between 4:00pm and 6:00pm to celebrate Bryophyte Ecology, chat with Professor Glime and learn more about open educational resources from scholarly communications librarians. Annelise Doll, Georgeann Larson, Linnea McGowan Hobmeier and Laurie Stark of the Van Pelt and Opie Library presented “A Day of Lean” Workshop at St. Norbert College’s Mulva Library in De Pere, WI on June 21st. 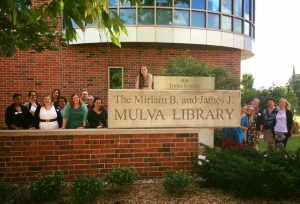 Attendees to the workshop included the Mulva library staff, as well as representatives from local libraries, including the Medical College of Wisconsin, University of Wisconsin – Green Bay, Northeast Wisconsin Intertype Libraries (NEWIL) and Cardinal Stritch University. The workshop included an “Introduction to Lean” session, two breakout sessions in which attendees had an opportunity to learn about and practice various lean tools, a poster session, and a “Roadmap to True North: A Case Study” session. The event was sponsored by St. Norbert College and the Mulva Library. Bryophyte Ecology is the result of more than a decade of research, collaboration and composition by Professor Emerita Janice Glime and many contributors and photographers. The five volume work is unique not only as the most recent comprehensive reference on bryophyte ecology, but because it is “open” to the world. Bryophyte Ecology was initially self-published on the web and is now accessible on Digital Commons @ Michigan Tech. Moving the work to Digital Commons ensures long-term preservation and easier access. Additionally, the work reaches top slots using any search engine. Professor Glime’s goal in creating an open work “was to reach a broad audience in an affordable format with lots of illustrations and a readable style.” Bryophyte Ecology has been used as a textbook, reference source, and field guide. It contains many color photographs, information on physiological ecology, bryological interactions, methods of collection and various uses of bryophytes as well as question sections throughout to facilitate learning. Leading up to finals and the last day of the semester, the library will be open extended hours this week and next. Steve Lehto’s Michigan Notable Book, Preston Tucker and His Battle to Build the Car of Tomorrow tells the story of the man who tried to start his own car company after World War II. He promised an advanced car at an affordable price but his enterprise was shut down before he could build more than 51 cars. Was he merely trying the impossible or were there darker forces operating against him? Please join us for a presentation by Mr. Lehto on Monday, April 10th, at 4PM in the East Reading Room of Michigan Tech’s Van Pelt and Opie Library. Opportunity to purchase this book will be available before and after the talk. Refreshments will be served. Steve Lehto has written a dozen books and has a weekly column at RoadandTrack.com. This is his fourth Michigan Notable book. Need info on chemical substances, reactions, and more? Please join the Van Pelt and Opie Library and the Graduate Student Government for an extended Lunch and Learn on the resource SciFinder. Participants will learn how to efficiently and effectively scour the literature landscape and keep updated on the most relevant research findings in their respective fields. The workshop is applicable to both advanced and entry-level SciFinder users. During the workshop, you’ll be asked to interactively engage with SciFinder, so please bring a laptop if available. The Friends of the Michigan Tech Library will have a used book sale and free hot chocolate and cookies in the lobby of the Van Pelt and Opie Library. They will also have copper mining scene notecards and Michigan Tech blankets for sale. Saturday, February 11, 11AM – 4PM. On Thursday, October 20, the Friends of the Michigan Tech Library will hold their annual meeting from 4:30PM – 6:00PM in the East Reading Room of the Van Pelt and Opie Library. 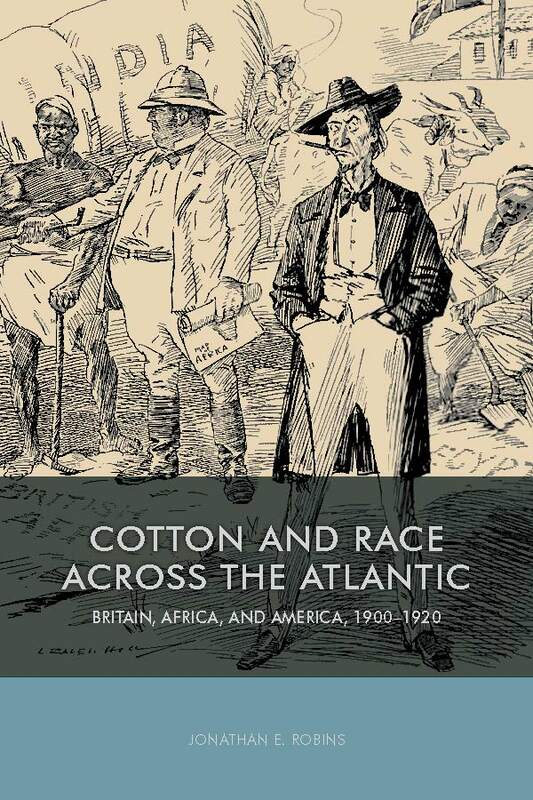 Following a brief business meeting at 4:45PM, Jonathon Robins, assistant professor of global history in the Social Sciences department at Michigan Tech, will present a talk on his first book, Cotton and Race Across the Atlantic: Britain, Africa, and America 1900-1920. In 1902, British business launched an ambitious program to transform Britain’s African colonies into major cotton producers, in the hopes of ending Britain’s century-long reliance on the American South for raw materials. 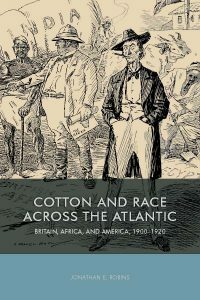 In Cotton and Race Across the Atlantic, Jonathan E. Robins explores the complex history of this British project, which brought European industrialists, African-American scientists, and African kings together to reshape the ways in which millions of African farmers worked. Robins will present an overview of the book, and discuss how his work in a number of very different archives and libraries shaped his writing process. Robins is a historian of commodities, examining the connections between agriculture, industry, and consumers around the globe. He has published articles and book chapters on food history, agriculture, colonialism, industrial organization, and consumerism.